Have you heard about the latest form of device that could be in your pockets everywhere you go to gain the knowledge you need? Mobile learning is a novel form of sharing information through the common use of conventional and portable electronic devices. Portable devices can be handled easily without any constraints of a particular place or without any limitation to boundary like mobiles, smartphones, tablets, iPads. During ancient times the mode of sharing ideas and values was by a teacher in terms of teaching and assigning some practical works to enhance the skills, to an assigned group of students. It used to take a long period of time sometimes half of the life to learn basic knowledge. The information generated in various fields like history, geography science, environmental studies has not been preserved efficiently, only the published work in recent years is been used as a source of knowledge or research. The modern times has changed with the use of information technology the virtual things can be readily connect you to the physical world. The IT sector has emerged as beginning of a new era with advanced mode of learning. Mobile learning is the innovative method of sharing and learning the data instantly. The education sector started taking a new shape and expanded to international levels, they needed a technology which could connect the reader and you worldwide and mobile learning acted as a technological boon for it. Even If you have to connect a person sitting in America from China, mobile learning has made it possible by transfer of videos and voice messages, important mails right away. The recordings of meetings conferences and lectures can be sent readily if required. The design for mobile learning should be user friendly. The hyperlinks for the key points should be easily accessed and visible to users. The sending and transferring of data in a controlled manner should be done so that it does not affect the feasibility and ethical issues of the data. The major applications should come integrated with the device. The data should be readily available and can be accessed through a large no of people. The updates should be notified, so that user can upgrade to the newest version. The knowledge provided should be productive, mutually supportive at a dynamic level. Different formats can be used in mobile learning like video, audio, animation, infographic, GPS etc. The audio is by listening and video enables you to see the picture with the audio, animation involves learning with cartoons and Global Positioning System is a space-based satellite navigation system that provides location and time information in all conditions. Information graphics or Infographics are graphic visual representations of information, data or knowledge intended to present complex information quickly. Mobile learning can be used in various sectors like in business, arts graphics, science, engineering accounting and so on. It can effectively connect with a large no of audience within no time limit. Mobile learning technique actually gives a platform to have equal opportunities by sharing same level of knowledge, and to decide the further application and career opportunities. Even people who cannot afford expensive higher education and courses can get to know about the new finding within seconds but obviously it depends on the level of curiosity and awareness someone has about any application and thirst of getting quality knowledge. Thousands of good quality educational Apps have been downloaded in Apple or Android App stores every minute with engaging and interactive contents that enhance the attentiveness of people. 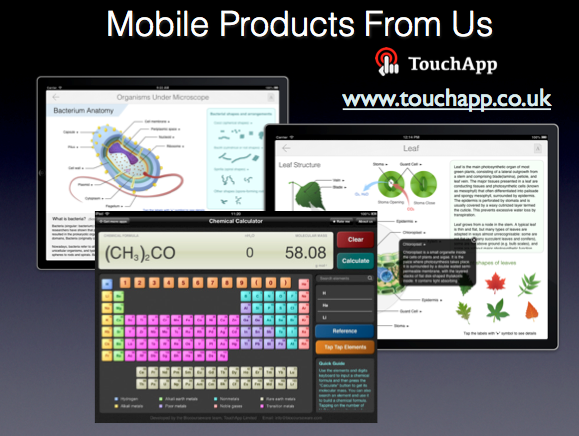 TouchApp is proud to produce some of the best mobile education applications available on the market. A great example of one of TouchApp’s most popular apps is ‘Focus on Plant’. ‘Focus on Plant’ is designed to help the user learn more about the basic knowledge of plant science. Designed with the beautiful interactive illustrators, interactive self-test and audible glossary, the app makes the learning touchable and fun. We are keep on exploiting new ways of mobile learning to fulfil the diversified requirements of modern education. This entry was posted in Education and tagged design for mobile learning, educational app, eLearning, Mobile Learning on September 15, 2013 by touchapp.